As technology continues to advance, the options for searching the Internet and consuming media have grown exponentially. Desktop PCs and TVs are now supplemented with various types of tablets and smartphones that can differ dramatically in size. Consumer habits have changed as well, evolving with available technology to the point that the ability to access a website quickly and conveniently on any device, at any time is expected. That means that the ability of any website to appeal to users and keep them coming back relies heavily on the user experience it provides. Both development and design are key components of a good website and as ecommerce shifts more and more to mobile phones and tablets they are only going to grow more important. Additionally, the on-demand economy is a fickle beast; users do not view patience as a virtue and will gladly change consumer allegiances if a competitor offers a less frustrating interface. As such, it’s vital that your site uses a responsive web design to maintain a high-quality experience for the user no matter what device they’re on. 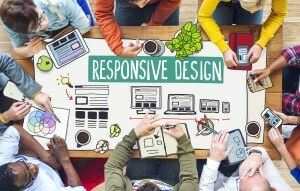 Here are a few design best practices to keep in mind to help design a more responsive website. In case you missed it, the mobile revolution is over. Smartphones are everywhere these days and have become an integral part of everyday life for many worldwide. And with the constantly evolving capabilities of these devices, the amount of mobile traffic your website will likely see is only going to increase. So in terms of design, the smallest version of your website may actually be the most important, which means you need to re-evaluate your approach to designing a website to ensure that you’re focused on optimizing for audiences viewing from screens of all shapes and sizes. Given that compressing maximum information into minimum space effectively is not easy, it’s a good idea to begin designing for the smallest layout first and then build out the site from there. Working outward like this will help you scale the design beyond simply adjusting parameters for various screen sizes and make it easier to adapt to a wider range of devices. Remember that when you’re scaling your design that your goal should not be to achieve the exact same experience on every screen size. Instead, seek to maintain a consistent spirit throughout all versions of your site by providing a similar experience that’s specifically tailored to the display size. To do this you need to consider the circumstances and context surrounding each visit, and be sure to feature the most relevant content more prominently as the screen gets smaller instead of trying to condense everything uniformly. Knowing what motivates your visitors will help you prioritize content to address their needs more responsively. In addition to being clearly legible and visually appealing, a truly responsive site provides the user with intuitive navigation and easy input methods when laid out on displays large and small. Larger displays allow for nuance and details that are impractical when a user is navigating and typing with their fingers on a smartphone. Although consistent design is one of the core rules of user experience design, sometimes rules are made to be broken and this is one of those times. Adjusting the navigation menu appearance and labeling or enlarging buttons and forms all help improve user interface and help keep the experience consistent across all versions of your website.